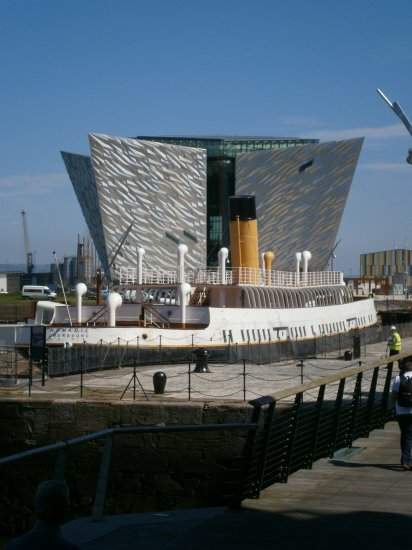 Titanic's 'little sister' was designed and built in Belfast at the same time as her famous sibling. The luxurious interior and quarter size dimensions reflected those of Titanic whose 1st and 2nd class passengers she ferried from Cherbourg ahead of the liner's ill-fated Atlantic crossing. During her eclectic lifetime, Nomadic served in both World Wars, tendered thousands more trans-Atlantic passengers and spent three decades on the Seine as a floating restaurant beneath the shadow of the Eiffel Tower. Famous passengers through the years have included the 'Unsinkable' Molly Brown, Marie Curie, Charlie Chaplin, and Elizabeth Taylor and Richard Burton. 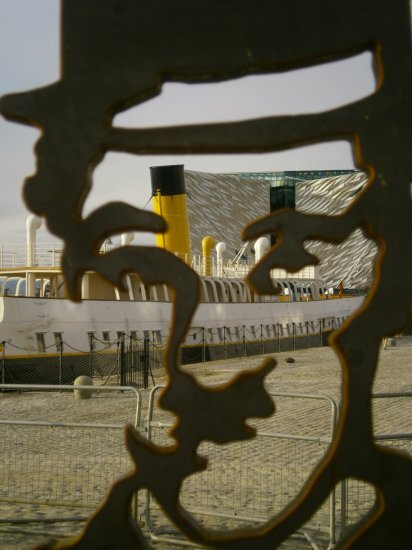 And so to Belfast where, having been purchased by the local government in 2006, she now resides beneath the shadow of another iconic city landmark - Titanic Belfast. 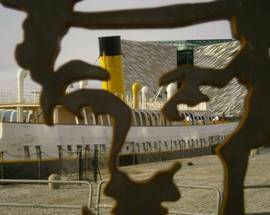 The last White Star Line vessel afloat, Nomadic provides a unique and important link with Belfast's maritime heritage. 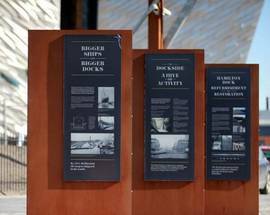 Years of painstaking restoration have preserved her former glory, and touch screens, info panels, displays and projected characters from Titanic's heyday recount her fascinating past. 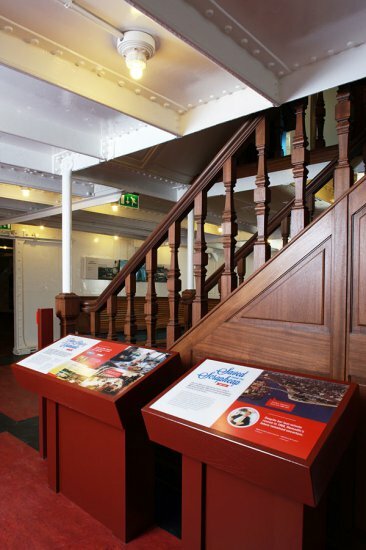 Compare the 1st and 2nd class quarters, explore the engine room, gaze up inside the funnel and peek into the Captain's cabin and crew quarters to imagine what life was life for Nomadic's inhabitants. 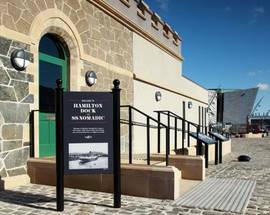 Guides will help explain her history further, while period costumes, games and a wooden model of Cherbourg Harbour will keep children entertained. 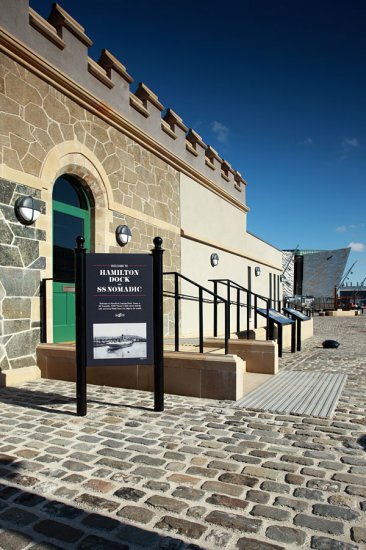 A small shop and coffee van are also in site, and paid parking is available at Titanic Belfast and the Odyssey. 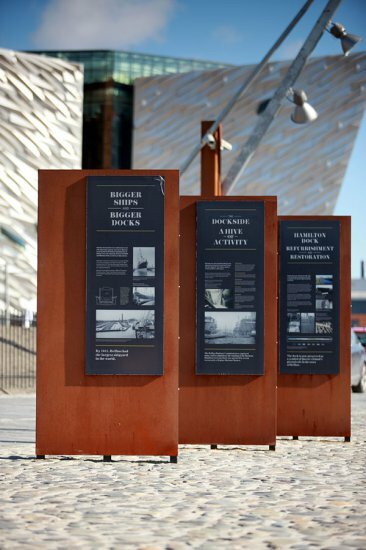 But, through it all, the sobering reality that will stay with visitors is that one third of Nomadic's 172 Titanic passengers perished with the ship. Daily June-Aug 09:00 - 19:00, April-May & Sept 09:00 - 18:00, Oct-March 10:00 - 17:00. 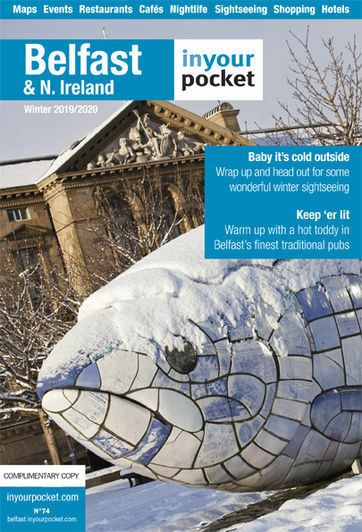 Adult £7, conc/5-16 £5, U5 Free, Family Ticket £20. Tickets incl. 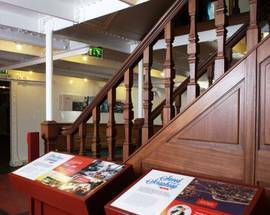 admission to Titanic Belfast: Adult £17, 5-16 £7.25, U5 Free, Student/Unemployed/Senior Citizen (Mon-Fri) £12.50, (Sat+Sun) £14.50, 2+2 £42. White Star Premium Pass incl. 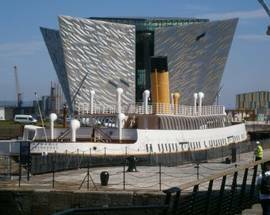 Titanic Belfast & Titanic Belfast Discovery Tour: Adult £25, conc. £20, child £15.